You are here: Home » MEDIA » Books » Spellwright (book 1) by Blake Charlton (book review). 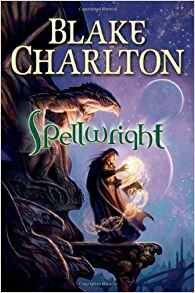 Spellwright (book 1) by Blake Charlton (book review). ‘Spellwright’ is the first book in a fantasy trilogy by Blake Charlton. It is set in a world where humankind and their gods fled the land they had originated from to protect themselves from demons. They had sailed to a new land and killed the Cthonic people, who resided there. Among humans there are those that can sense and use magic in different forms called spellwrights. Of these, there are many kinds such as wizards, who use spells written on paper and form magic from their muscles, and druids, who write their spells into living tissue such as wood, roots and seeds. Each order of spellcasters have their own unique spellcasting languages that they keep secret from the other orders. The different orders gather together every decade for a convocation in which they renew previous peace treaties to not use magic in war. The convocation this year is being held at Starhaven, a wizard academy. Nicodemus Weal is a young spellwright apprenticed to Magister Shannon, a legendary wizard. Unfortunately, Nicodemus is also a cacographer, a spellwright who ‘misspells’. When he forms any magic that is not simple, he misspells the formation runes and either the spell fails or mutates dangerously. He cannot touch other objects made entirely of spells, such as gargoyles (non-sentient creatures made from spells to serve wizards various tasks) as his cacography will cause the spells making up the gargoyle to misspell and destroy it. Nicodemus had once been thought to be the ‘Halcyon’, the great wizard who was prophesied to save humanity and their magic from the demons, who would finally arrive on this land and start a war. If not for his cacography, Nicodemus would surely be the ‘Halcyon’ as he has every other prophesied attribute. Though the wizards have ruled out Nicodemus as the ‘Halcyon’, there is a powerful creature hunting him, who uses old spells that have been lost to humanity since they crossed to this land. Magister Shannon seeks to protect him but the wizard sentinels (wizard police) who are investigating murders caused by the creature, suspect Shannon of them. The druids, Deidre and Kylan, also think Nicodemus is the ‘Peregrine’ (the druid name for the ‘Halcyon’) and try to convince him to leave Starhaven and go to their goddess, who would offer him safety and prepare him for the coming demons. ‘Spellwright’ is a fast-paced and involved book. Charlton creates an intricate world of magic, where each order of spellwrights have very distinct and complex magical languages which each have their own set of rules. While I appreciate the depth Charlton went into with the magical world, it took a while to get into the book and understand what was going on. I had to keep going back and re-reading previous pages when I had finally been given enough information to understand them. I found that after making us aware of how Nicodemus had worked painstakingly hard to learn magic with his cacography as the novel progressed he started to gain magical knowledge very quickly. While there were drawbacks to this knowledge, I didn’t feel that it should have been so easy. Nicodemus’ cacography was refreshing as it was obviously created to emulate dyslexia. I have never before read a book where the protagonist is dyslexic and although Nicodemus struggles with it, he never lets it limit him or his ambitions which is an encouraging message for both the dyslexic and non-dyslexic people, who will hopefully read this book. « It Crept From The Tomb edited by Peter Normanton (book review).